Hi again! 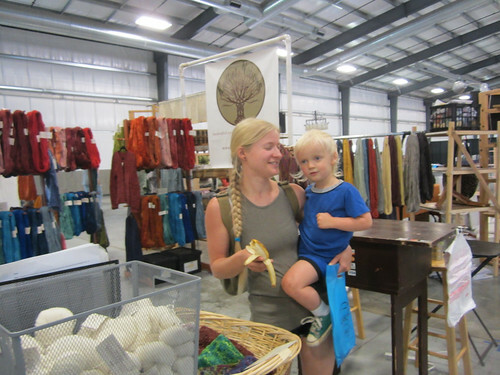 The Shenandoah Valley Fiber Festival was great with wonderful weather and lots of attendees. 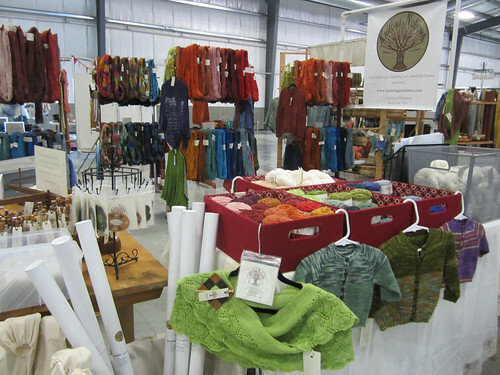 I have been enjoying a few days off while waiting for my next show set up on Friday for the Fall Fiber Festival of Virginia . I have mostly spent my time catching up on my reading and knitting, but I did go out on Tuesday to visit Luray Caverns. I had a nice time and have a few pictures, though not great ones I am afraid. I have been re-reading the Cormoran Strike novels before starting the newest one that was released last week; Lethal White. It’s not a genre I read often but I can’t resist anything written by J.K.Rowling. These are both interesting as far as the mystery goes, and, even better to me, they are also character driven stories. I have loved getting to know the main characters Cormoran and Robin as the series has grown. It’s what she does so well. I am almost finished with The Silkworm already. In knitting progress news; I have gotten to the last chart on Tendrilly which repeats 4x or 6x but I may be doing a hybrid size and repeat it 5x. If I do 4x it will leave about 3/4 of the 3rd skein but doing 6x will require a 4th skein. 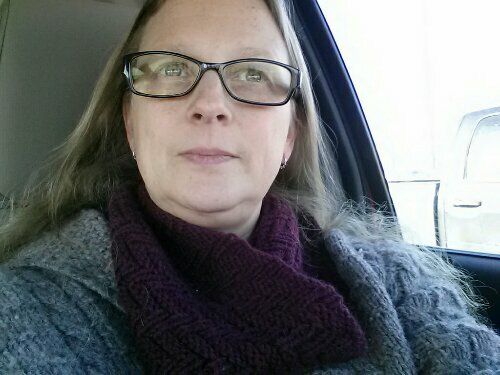 I am hoping to use just about 3 full skeins with my modification. I will know more as I approach that stage. When I get a chance I like to sample local micro-brews, and this was my find here in Virginia to enjoy on my little vacation. Cheers! This is the only picture I took over the holiday gatherings. 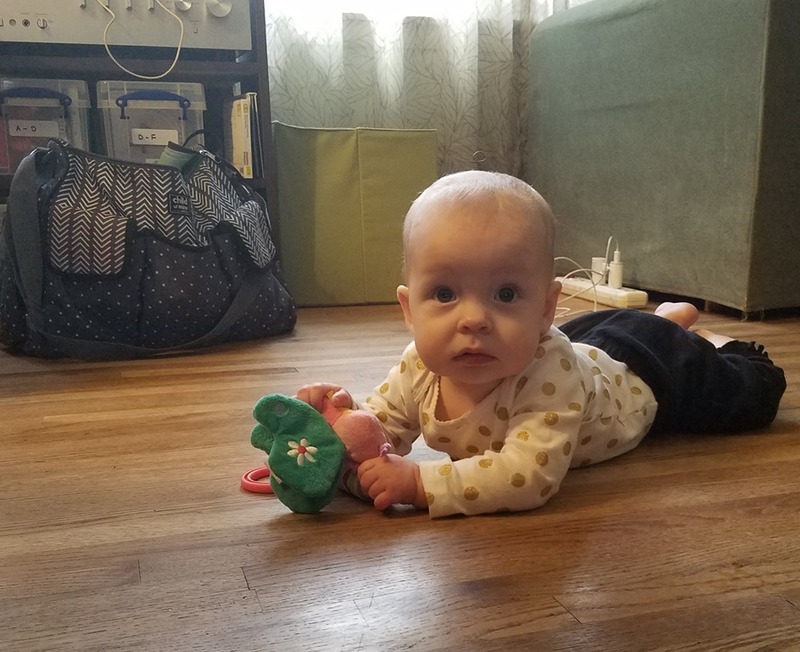 This is my grand daughter Pandora. She is eight months old now. I can’t believe I didn’t take more pictures. We had all of our Nashville family over for Christmas Day and some of them came over on New Years Day also to play Dungeons and Dragons. Break time is officially over now. We have resumed school and I have dyeing work to complete this week. I did some of it yesterday but the weather turned off wicked cold today and it’s getting colder for the rest of the weekend so I am waiting until Monday to finish the remainder of the order. I have gotten quite a good piece of the knitting done on my sweater. I have finished both sleeves and the back. I cast on the left front last night while watching season 2 of Sherlock. I wanted to re-watch everything before watching the first installment of Season 4. I am starting season 3 tonight. It’s about the only “TV” I watch. I prefer reading or listening to music to watching TV or movies, although I do like to watch a well made movie based on a classic book too. It’s good for knitting by. I have been on a classics kick lately. I have been working through a Great Courses audiobook on American Literature which has been very interesting and prompting me to re-read some classics and try a few I had passed over up until now like the Autobiography of Benjamin Franklin. I am to the lectures on Nathaniel Hawthorne at the moment. He has spent a lot of time on The Scarlet Letter which I have read a couple times. I may read it again or I am thinking about reading The House of Seven Gables since I only read it once quite a while ago. My oldest son also bought me a boxed set (books) of The Game of Thrones. He has tried to get me to read this series for awhile but I have been hesitant due to me knowing what the HBO series is like. I will probably give it a shot since he swears it’s not as graphic in the books and besides it’s easy to skim over that stuff if you choose when you are reading. Anyone read these? Yea or nay? What did you think of them if you read them? This is the best picture I could get on a rainy morning of my progress on the Bermuda Triangle shawl. 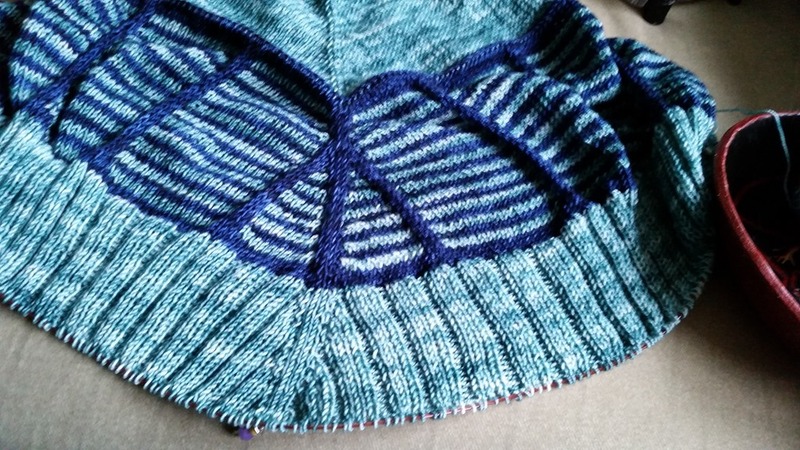 I am in the final stretch now with only 10 more rows of the ribbing and then the contrast color garter edge. I am looking forward to seeing how it changes after a blocking. Right now the slipped stitches are drawing it in some but I think the soak and block will fix it right up. I really like these colors together too. I dyed another large order for the mill this past weekend but since the daylight hours are so short and I was working until near dark every day, I didn’t get any pictures to show you. Just picture lots of colored fluff and some hand painted yarn. I can’t remember if I told you that I am finally doing a re-read of the Harry Potter books, but I am and they are even better after a long break of eight years. This is the first time I have read all seven books in succession and that is quite fun. I just started the Order of the Phoenix last night. The first three books are pretty fun and fast paced. I most noticed this time around that when you get to the fourth book, The Goblet of Fire, things do start to get a bit more serious, don’t they. The stakes get higher and I was more emotionally invested in what was happening to the characters. Personally I am moved many times with empathy for Harry and his struggles against the darkness and hatred that he is up against. His courage in the face of it what he barely understands but knows is evil is admirable. Sure he has help, but does that diminish his fortitude? Of course not. The truth is none of stand by our own strength and we all need help to combat evil in this world. Love is the antidote as he finds in the end and it is the same for us all. Perfect love casts out fear. 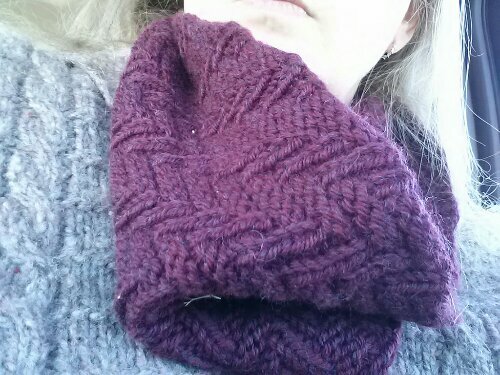 Okay it’s not much but I did finish the cowl last week. I have been wearing quite a lot. 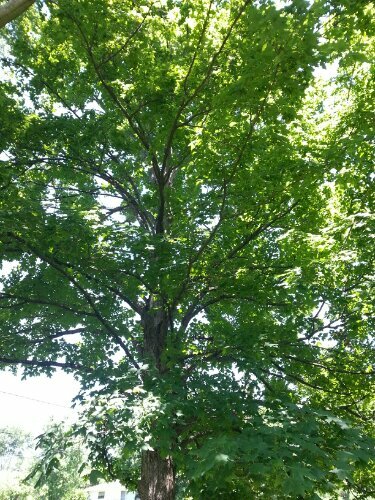 I took this picture (sorry for the off color. Bad lighting) in the truck on one of the coldest days we have had in years. We were in need of groceries during the worst cold following the Polar Vortex last week. It was 2 degrees F that morning. Glad that is over. It is a much warmer 50 this morning which is an immense improvement despite the gray drizzle. I once again have to make the trek out for victuals. Sigh. I really wish I didn’t dislike that chore so much since I have to do it so often it seems. I guess I can look on the bright side. It is a fine opportunity for listening to my current audio book. :-) I am towards the beginning of Little Dorrit by Charles Dickens which is quite good. I have been on an extensive Stephen King binge lately which has been fun but it is good to get back to some classics for a change. What are you reading lately? 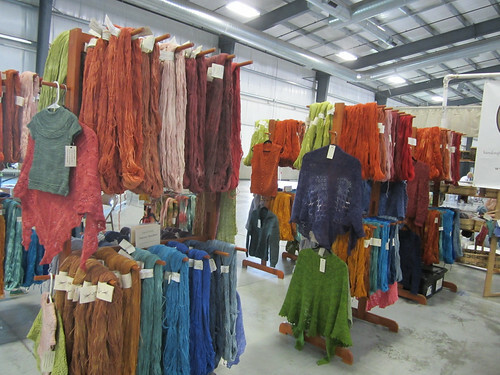 In preparation for our summer dye session I am brushing up on my color theory and mixing and deciding on what new colors to create this year. 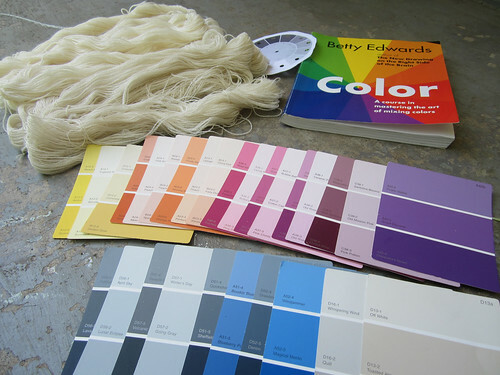 I was reading through Betty Edwards’ Color which is aimed at mixing and using paints/pigments. It is different than working with dyes because dyes are opaque and also you use depth of shade instead of adding white to adjust value, the color theory is still tremendously instructive. Her exercises inspired me to create a color wheel of my dye stocks to better arrange them in my mind of where they fall on it. Her ideas of assigning a clock face and in a circle is a great visual exercise for seeing “into” a color to identify it’s hue and it’s direct complement. You will also notice a gray scale in a circle which is helpful for determining value. 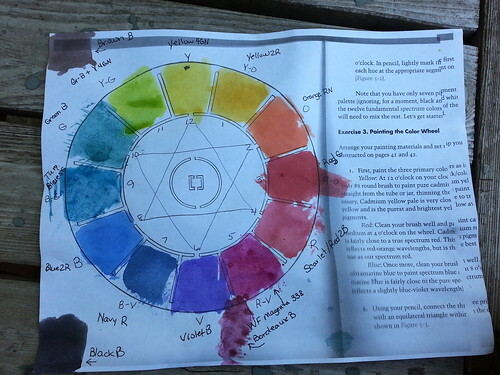 All this is invaluable to seeing a given color and mixing it. First you must identify the hue from the twelve (3 primary, 3 secondary, and 6 tertiary). Next judge the value, or lightness/darkness. 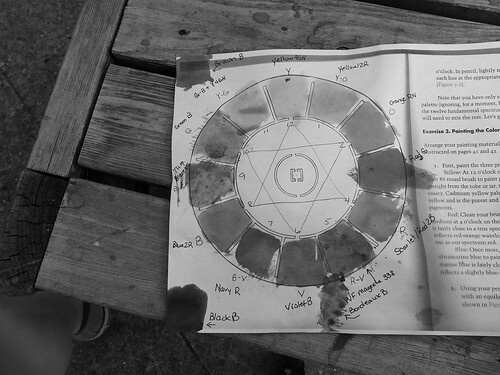 You can see on the black and white version of my stock color wheel below how those translate. Thirdly determine the intensity (saturation of hue). Is it closer to pure hue or “dulled”. Here’s where knowing the complements by heart is invaluable. On the knitting front I did get a bit accomplished on Sorrel this week. 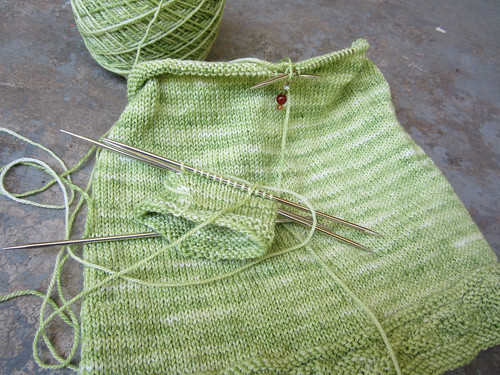 I completed the body and one sleeve while re-watching A Study in Pink which is the new PBS series Sherlock. 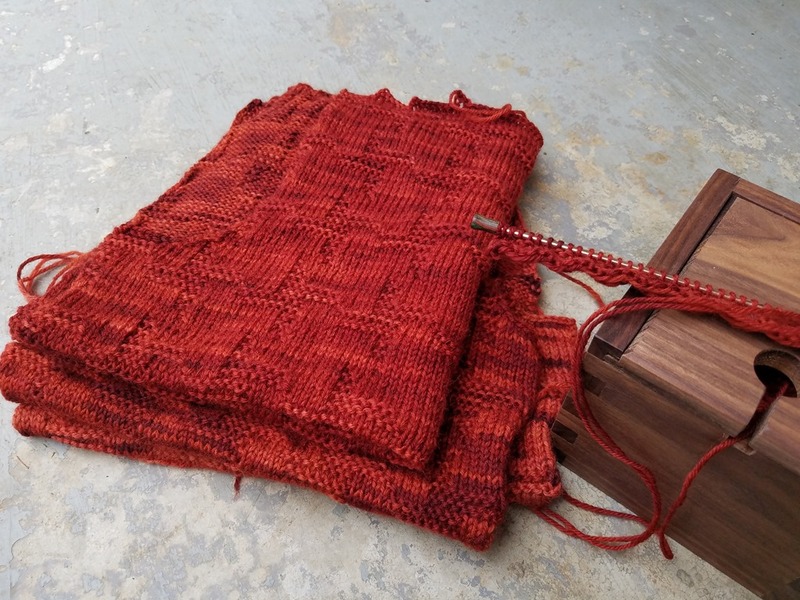 I finished A Study in Scarlet and The Sign of the Four in the book and so it was fun to watch that and get some knitting done. 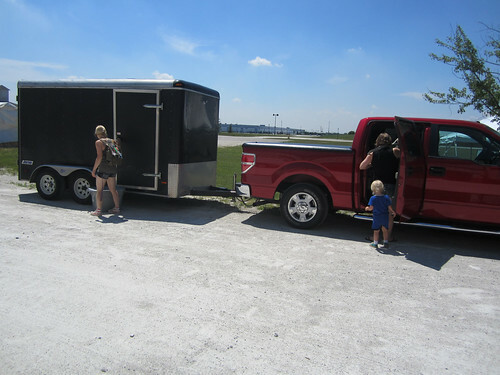 We are traveling again this weekend. 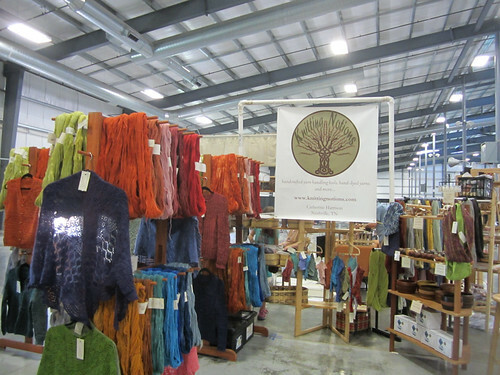 We are in the Chicago area for the Midwest Fiber and Folk Art Fair which is n it’s 7th year. We have come every year from it’s inception and it is one of our favorites. I really love the venue here in Lake County Fairgrounds. I think this has been the best location and I hope it has finally found a permanent home. This is the third venue since the first three years in Crystal Lake. When we return from Chicago on Monday we will have the remainder of June, the whole of July and the first week of August at home, as I have probably mentioned before. 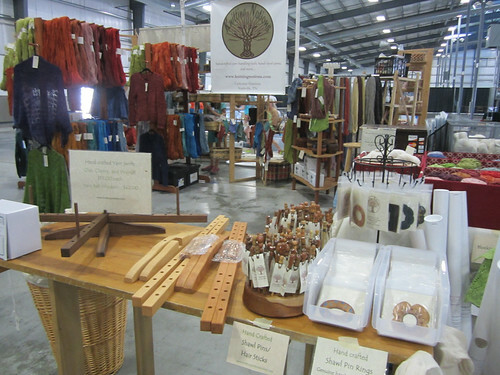 We will be spending that time firing up the dye pots and the lathe to restock for the rest of the season. My Classics read was The Age of Innocence and I liked this one a lot. Well okay I was irritated by the ending but I get it. He loved the idea of her more than the actuality and it would have been a disappointment, or a least he wasn’t willing to risk it anyway. Eh. It’s not what I would have done but I get it. I did really enjoy the unfolding of the story though. The third book I read was Shutter Island. Again this comes from a group read on Goodreads, the Stephen King Fans group. I also might never have noticed this one despite the fact that I apparently watched the movie in 2011 according to my Netflix history. I vaguely recall the movie but fortunately I didn’t recall the details because that would have spoiled the book. :-) It was very compelling reading. Again the ending here is a bit…disturbing I guess…but a worthwhile read to be sure. Okay I will close for now. Take care! We are really enjoying our weeks off around here. I am still reading a lot and knitting a little. The summer is in full swing. 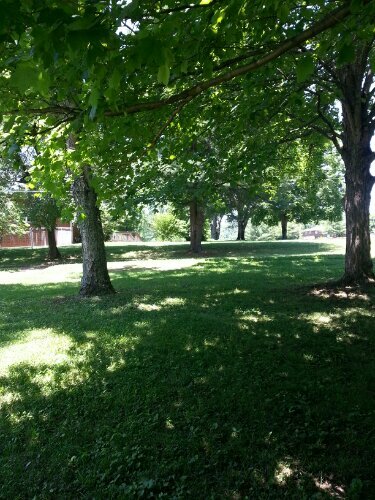 The trees are gloriously green and lush. 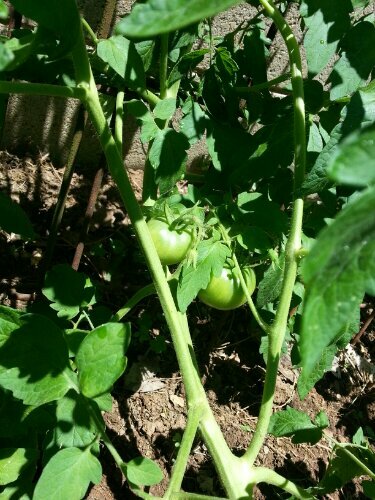 The tomatoes are setting their fruit and we can hardly wait for the first harvest. We need to get into production mode soon and the orders are in for yarn to dye. The wood shop will also be opened back up soon but for this one more week we take a small break and catch up on life. What am I reading you ask? Well I finished the latest Dan Brown novel, Inferno. It was okay and certainly was surprising in the ending, but I didn’t care for the preachy way the “crisis” was handled. I give it 3 stars for pure entertainment value and for the fact that he did at least attempt to change up his formula some what. I also started Age of Innocence for the Classics group on Goodreads. This is very readable and I am enjoying it so far as well. 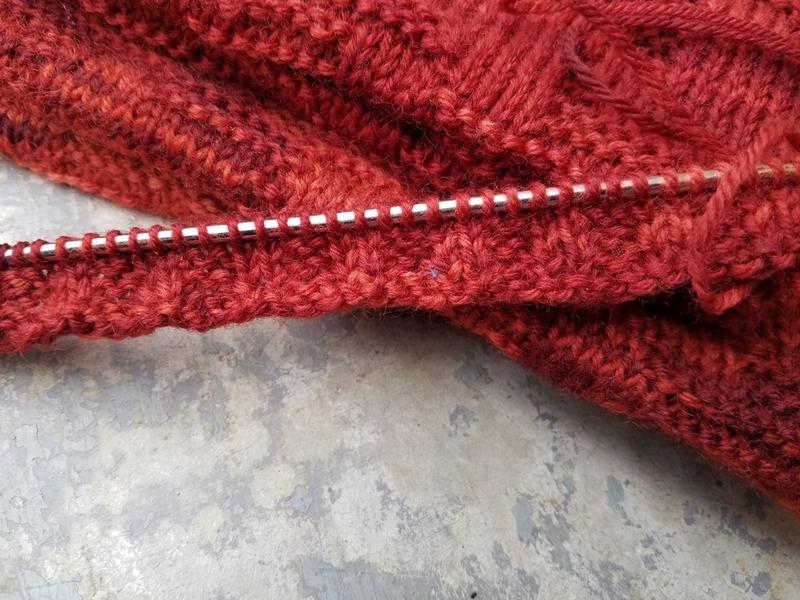 Okay well maybe I will have some new knitting to show off next post but I hope you don’t mind my sharing my reading with you.